North Korea’s Kim Yo Jong returned home from the Pyeongchang Olympics today, after setting a world record in the sport of deceiving the fawning western press. It’s easy to assume that you have somehow missed a peace agreement, a nuclear disarmament agreement for North Korea, the end of the DMZ, or even the beginning of talks between the Koreas and the US. It may not be what you expect, but I do have some surprising and shocking news for you – You haven’t missed a thing. What you are seeing is merely a facade, propaganda by North Korea that has been aided and abetted by South Korea, the IOC (International Olympic Committee) and the MSM. North Korean Dictator Kim Jung Un may be crazy but he is not stupid, and his Country’s “efforts” during these Winter Games proves just that. This isolated and reclusive regime has been cut off from the rest of the World for decades. The only information that gets out is State sponsored propaganda as we have seen with “Rocket Man” touting his increasing and fast evolving military arsenal. Very few outsiders come into the Country and very little is known even about the Supreme Leader himself. How could this leader and his Country get the attention of the World in a more positive light, while avoiding the US, and still keeping business as usual for North Korea? The Olympic Games gave Kim Jung Un the perfect opportunity he was looking for. South Korea made a deal in large part out of desperation to ease tensions with this Rogue Nation, and to secure safety for the Olympic Games in their Country, just a short distance from this tyrant and his missiles aimed at their major cities, something which North Korea knew would be a major bargaining chip for them. For the IOC, this “unity” looks good for the games regardless of the real agenda or what happens after the game are over. The media came along for the ride, fooled by a “good story”, regardless of how shallow the story is, along with their constant opposition to President Trump which leads them to seize on any opportunity to oppose or discredit the President. If there had been real change behind this symbolic action, then it would have been the inspirational story it’s being billed as and it would be something to celebrate. The reality is, there has been no change in the Kim regime’s development of Nuclear weapons meant to threaten the rest of the world, there have been no further talks, there have been no treaties or agreements to even halt the activities of North Korea. This symbolic unity at the Olympic Games is nothing but a show for the rest of the world. Kim Jung Un has manipulated and fooled both South Korea and the IOC into giving him an international audience in which to try to promote a “kinder” image of his Country, an image he hopes to use to his advantage especially against the United States, a trap which the MSM has already fallen into. His unification with South Korea is a way to get between the US and it’s ally South Korea, to get South Korea to work with them and do what they want, keeping the US out of it. In the midst of this historic moment of unity, there is no real plan or agenda by North Korea to change course in the slightest way. (And a side note – this unification isn’t as historic as it’s being billed. Both Koreas have marched as one team in the Opening Ceremonies twice before – 2000 and 2004 – and we see what change that unity brought about long term). This wasn’t a last minute decision by Kim Jung Un in “goodwill” or “good faith”, and it’s not an olive branch. This is a strategic and well planned move by Kim to strengthen his position, better his image, and manipulate South Korea and the World. The IOC itself is a weak organization, out for profit. Don’t forget the IOC is the same organization that kicked Russian out of this year’s Winter Games for their dopping scandal, yet a majority of their athletes can still participate in the games as “Olympic Athletes from Russia.” Some punishment. They may think this show of Korean unity is giving the games wonderful publicity and is symbolic of the Olympic Games, South Korea may think it’s providing safety and hope of future negotiations, but whether both realize it or not, what they have done has actually helped Kim Jung Un and North Korea gain even more power. The MSM in the United States, for a long time now, has not been about facts, truth and honesty, it’s been about a political agenda. Since the election of Pres Trump, that agenda has gone into overdrive, with it’s sole focusing to oppose Pres Trump and his administration at all cost, even if doing so means undermining the United States. The MSM will gladly act as a propaganda arm of of North Korea, defending and promoting one of the most brutal dictators on earth, if they can somehow prove Pres Trump is really the tyrant they think he is. It is this attitude which is behind the coverage of these Winter Games so far. 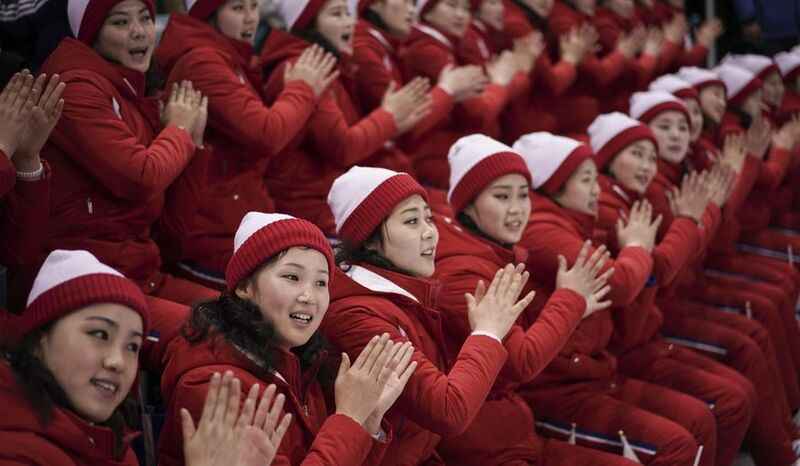 The MSM has criticized Vice President Mike Pence for not standing when the joint Korean team entered the arena for the Opening Ceremony, or for snubbing Kim Jung Un’s sister at the Ceremony, while they tout North Korea with headlines like “North Korea’s Cheerleaders steal the spotlight at Winter Games” (ABC), “Kim Jung Un’s Sister is stealing the show at the Winter Olympics” (CNN),”The Ivanka Trump of North Korea captivates people of the South at the Olympics” (Washington Post). All of this while North Korea remains a threat to the US and the World – which includes them. The actions of the MSM are incredibly naive and foolish. There used to be a time when we as a Country could debate politics and oppose each other on issues, but quickly put those differences aside and come together against a foreign enemy. In the era of “Resist” and the anti-Trump movement, it’s become an act of “cutting of your nose to spite your face”. They would truly rather see Pres Trump fail, even if it means this Country fails, rather than see Pres Trump succeed. It is this mentality that has lead their effort to embrace and praise the fake show of unity in Korea, while making every effort to destroy unity here in the United States. We should all be alarmed at such actions. Felicia Tweedy is a political activist who has worked on both sides of the aisle, and an entertainment industry professional. Hillary Clinton: Unqualified Pot Meets Unfit Kettle.